Have you ever settled on a meal only to change the protein or another ingredient but you didn’t consider the whole meal in that change? I did that with this soup. I was basing this recipe off of a beef soup I discovered in some random cookbook and was all prepared for beef but instead, I thawed chicken. That left me with a poultry protein and a beef broth. Oops. I’m pleading pregnancy brain. I really can’t believe I did that and yet I can. Thankfully, despite my mistake, the soup turned delicious. I remade it later, the proper way with chicken meat and chicken broth and loved it even more. 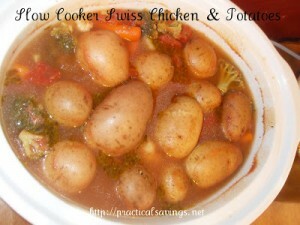 I love slow cooker meals. They make life on chaotic days seem just a tad less stressful. In the crock, stir in the tomatoes, broth, thyme, onions and veggie blend until well mixed. Place the chicken in the mixture, making sure it's covered by the liquid. Place the potatoes on top and cover. Cook for 4 hours on high or 8 hours on low.